My first favourite is that I've actually been keeping up with supplementation! It recently clicked that I should try a liquid delivery system(?) and it has really been working for me. They're a lot easier to take and a lot easier to remember to take. Liquids don't require water and I don't find that they make me feel ill even if I happen to take them on an empty stomach. So, with that in mind, I decided to replace most of my supplements with liquid versions. Enter the Viridian Vegan EPA/DHA Oil and Nature's Aid Liquid Vitamin D3. For those who don't know already, Hynt Beauty is now stocked in the UK at Glow Organic and it is quickly becoming one of my favourite makeup brands. They're carmine-free, most of their products are vegan, and their ingredients are fantastic. Unfortunately I didn't have great luck with one of their Suite eyeshadow palettes, but this Sun Prep has become one of my new favourite products of all time. It's a super innovative semi-clear SPF that works as not only sun protection, but a pretty awesome makeup primer. I had originally planned to keep it for special occasions (it's a bit pricey) but I'm having serious trouble trying not to use it every day. Spoiler alert: I'm also loving their cult Duet concealer and have just ordered one of their Alto matte blushes. ...and that ridiculously long intro was to introduce my next favourite, the Ere Perez Clear Mascara. As my eyebrows are now darker via tinting, I've only been needing clear mascara to keep them looking neat. This Ere Perez offering isn't the cheapest option (try Pacifica for something more budget friendly) but I decided to pick it up for one of my LoveLula blog posts and I've been really enjoying it. I was recently contacted by a PR company who graciously gifted me some products by Sukin and Nanshy. Nanshy offer 100% vegan and cruelty free brushes at a really great price point and I was instantly attracted to the Buffed Base Brush as I've heard a lot about using a dense dome brush for applying liquid foundation. Well, I tried it with my HG Sappho foundation and I am very much impressed. I've found that some other brushes can make it streaky but with this brush the foundation applies flawlessly and lasts all day. You may have seen Walden Perfumes floating around lately as they are the new perfume offering from LoveLula. I was lucky enough to take part in the trial process for these perfumes and have been very excited about their launch ever since. A Different Drummer is my favourite from the launched scents and contains notes of pepper, cedarwood, amber, amyris, and sandalwood. It's a very unisex scent and offers something completely different from the heavy florals that usually appear within natural perfumes. Walden perfumes are a little pricey but I'll definitely be putting another bottle on my birthday list when it runs out. Check out the full selection of Walden Perfumes here. Alternatively, you can also try them all in a trial set. So I haven't blogged in over a month... but I have an excuse! For those of you who don't follow me on Twitter, I am currently writing my undergraduate dissertation (due in just under two weeks) and it has successfully taken over my life. This unfortunately, doesn't leave too much time for blogging. Posts may be few and far between for the remainder of April but today I want to talk about a few new makeup bits that I have been trying recently. 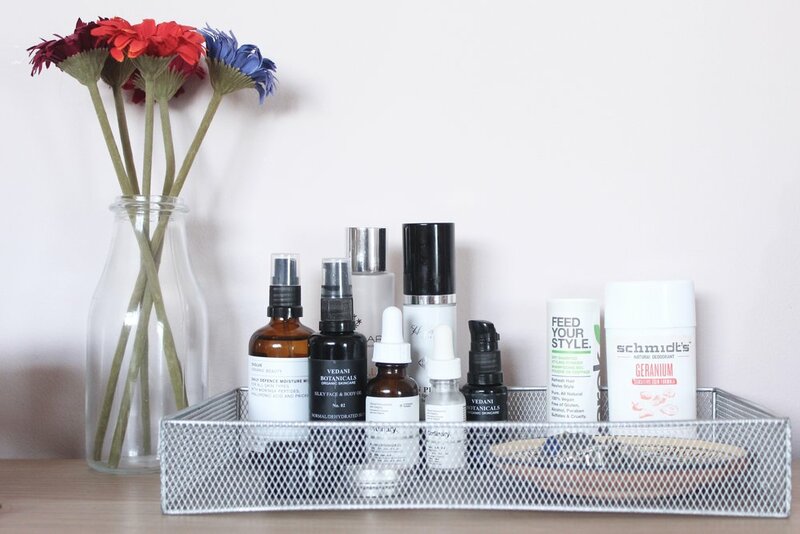 It was my birthday on 22nd March and I treated myself to some bits from Content Beauty (I love visiting their brick and mortar store in London) and then a few days ago, I woke up to the wonderful news that Hynt Beauty are now available from a UK stockist - Glow Organic Brighton. Of course I jumped straight on it and ordered some samples. I've spoken about the Hynt Beauty Suite Sweet Canyon Eyeshadow Palette before, and although I don't use it too often anymore, I've been dying to try some more of their line. I haven't really tried these properly yet (they literally turned up this morning) but I've heard amazing things about Hynt's cult concealer. It's loved by green makeup artists and offers super full coverage, which is rare for a natural concealer. It comes in a variety of shades and I've obviously gone for the lightest pair. On first impressions I think 'Light' may be a better shade for me as it is yellow-based. 'Fair' is extremely pink and although I'm pale, I'm not cool-toned in the slightest. My skin is neutral/leaning warm and so I suspect 'Light' would be better for spot concealing; when colour matching is key. I think the shade would also work under my eyes but it would be nice to have a lighter shade that is still neutral or slightly yellow. More testing is needed but from what I've seen so far, this sample could last me all year. It's really creamy and SUPER pigmented so only the tiniest amount is needed for your whole face. Hynt sent me a sample of their Skin Prep when I ordered the Suite eyeshadow palette. It was a super silky serum with marine bio-actives that I really enjoyed as a primer. I've never got round to buying a full size but I've always been curious about the Sun Prep - a similar product but with non-nano titanium dioxide SPF 30. Reviews for this stuff are glowing and now I've tried it, I can see why. This stuff is magic. It's almost completely transparent and really smooths out the skin. The formula would be perfect under makeup and it leaves no white cast whatsoever. I already know that I'll be getting a full size (edit: ordered). I don't think I'll be taking it to Croatia with me this summer (yep, I'm going again) as it's too fancy for constant reapplication but it's going to be great for the English summer and for making sure I wear SPF every day that I leave the house. I'm a committed disciple of the Alima Pure Satin Matin Foundation and so I've been eager to try its pressed counterpart. The formulas do seem to differ slightly: the pressed compact is lower coverage and way more yellow-toned, but I'm appreciating the tidier application (yay for less mess) and it really is a beautiful product. At this point I think I shall be continuing to repurchase the loose version but this definitely won't go to waste. The pressed formula and lighter coverage also make it great for mid-day touch ups. I have a habit of buying myself an expensive lipstick for my birthday and this was the winning contender for 2017. I've been dying to try the Phyto-Pigments line since it launched in the UK but I've been wanting to view/swatch the collection in person before picking anything up. I had a right swatch fest when I visiting Content and settled on 'Syrah' - a true mid-tone brown pink with the tiniest amount of shimmer (that doesn't really show up on the lips). I wasn't too sure about this shade when I brought it home but since then I've been wearing it a lot and really loving it. The formula is super moisturising and despite it's very creamy consistency, it does a good job of staying put throughout the day. I am interested in some of the other shades but these lipsticks really are expensive so I'm not sure if I'll be expanding my collection any time soon. Come on guys, do I really need an intro for these things anymore? This will forever be in my empties. No explanation needed (but I will be doing a full review soon). I’m trying to hunt down a cheaper alternative but unfortunately, I think I’m coming to the conclusion that nothing else keeps my scalp as soothed and itch-free, without the need for an ACV rinse. Also, it smells AMAZING. Green People sent me this a while ago along with the deodorant from the same line. I have done a full review, but in short, I do enjoy this shower gel. It has a really fresh scent but if I’m honest, if I’m to spend this much on a shower gel, then I’m probably more likely to spend the money on something like Bodhi & Birch that lasts about five times as long. I bought this argan oil way back when I first started using green beauty; in my first ever iHerb order in fact. I bought it with my hair in mind but actually ended up using it as a straight body oil in a bid to use it up. I also used it on my eczema and my skin actually reacted really well to it. However, I don’t think I’ll be repurchasing as there are other basic oils (like Soil Association certified sunflower oil from eNaissance – love!) that are easier to get hold of and have a similar effect on my angry skin. This was a really lovely basic scrub with decent ingredients, a decent price, and decent availability. I got this as a Christmas present from my boyfriend’s Dad who bought it from TK Maxx. The grapefruit was refreshing but not overpowering and the ‘scrubiness’ was just perfect. TK Maxx can actually be a bit of a gold mine for green beauty. I assume he picked it up just because he just saw the words ‘natural’ and ‘vegan’ but damn, he did well. Leave a comment below if you’d like to see a post on the kinds of brands you can pick up! I have done a full review on this. I absolutely loved this product the first time around when I received it as a PR sample and this was my repurchase. However, I do think my love has waned and I can no longer justify its price tag. These days I prefer to use something with a thinner consistency and a higher concentration of hyaluronic acid that can be mixed with other serums. I’m now really enjoying this offering from Evolve Beauty. The Herbfarmacy has more of a milky consistency and can pill when used with other products. If you prefer all your products to be organic certified then go for the Herbfarmacy (they are certified by the Soil Association – my certification of choice), but I do find the Evolve to be a lot more versatile. I was sent the Hynt Beauty Skin Prep as a free sample when I ordered by Sweet Canyon Palette. It’s a really lovely makeup primer which gorgeous botanical ingredients like algae (it does also contain carageenan though which I need to look into). I’d really consider buying the full size of this, but cannot decide whether I’d be more suited for their SPF version, the Sun Prep. Maybe I’ll try a sample of the later before I make my decision as I’m thinking of making another order for their cult concealer to see my dark circles through the early university mornings this winter. Harper's Bizarre is my absolute favourite indie vegan candle company. They make the most gorgeous scents and although they’re not all from essential oils, they don’t give me a headache (important) and they make me extremely happy. Zombielicious was another of their limited edition Halloween scents that I bought last year. And, as Halloween is again fast approaching, I’ll soon be stocking up when I see them at VegFest London and/or Cambridge Vegan Fair in October. This deo has HG status. Full review here. I have repurchased put decided to try the Cedarwood & Juniper scent. Another one of my favourite products that needs no explanation. Full review here (I swear I'm not doing this just to be lazy). I have loads of cleansing oils to use up at the moment but I will be repurchasing in the future. This is a really gorgeous product but unfortunately it makes me a little nervous because of the coconut oil. My skin has reacted badly to coconut oil in the past and so I'm hesitant to try anything bigger than this sample jar. I did enjoy it though and definitely suggest you try it if you have more combo/dry skin. Showing off a selection of my trash... you know you love it.